What if your tap could spew water that looked like radioactive mouthwash or alien blood? 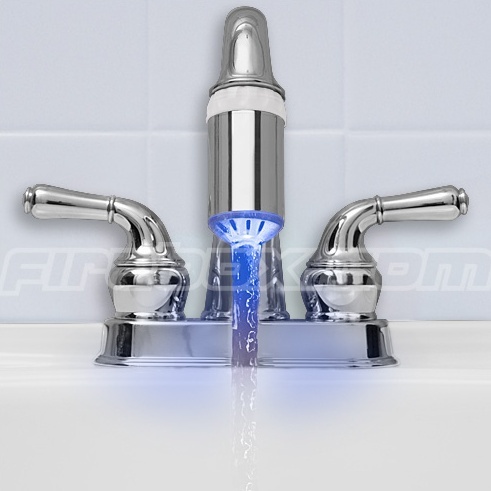 It can with the Glow Flow Tap. Totally bonkers but strangely practical, this neat little gizmo uses internal LEDs and a temperature sensor to turn water either blue or red. When the water is cold the Glow Flow illuminates the stream in a cool electric blue; when it’s hot it changes to a warm red. So as well as looking pretty phantasmagorical, the Glow Flow serves as a handy temperature indicator to help prevent kids scalding themselves.